Anabolik is a steroid, whose main action is based on the active substance methandienone. It is a modification of testosterone, in which the emphasis was placed on the reduction of androgenic properties and an increase in anabolic activity. Naposim influences the processes of protein synthesis, increasing muscle mass and improving its structure, modifying the strength and efficiency of training, increases appetite and strengthens the bone structure. It is a very powerful anabolic drug that is easily aromatized and has a high toxicity for the liver. Androgenic properties are half lower, and anabolic properties are twice as high as testosterone. The substance has been known since 1956 and was used to accelerate the recovery of tissue after burns, increase the overall tone in women. Athletes evaluated the anabolic effect only after half a century. Particularly to taste the drug has come to bodybuilders and power lifters. To date, the active substance Naposim, methandienone is part of a number of drugs used both injectively and orally. Often athletes reduce the name of all these means to the ordinary "methane". The drug directly affects the processes of protein synthesis in the body, which causes an explosive set of muscle mass in a short time. It is also associated with the stimulation of calcium production, which begins to enter large amounts of bone tissue, strengthening the spine and the musculoskeletal system. 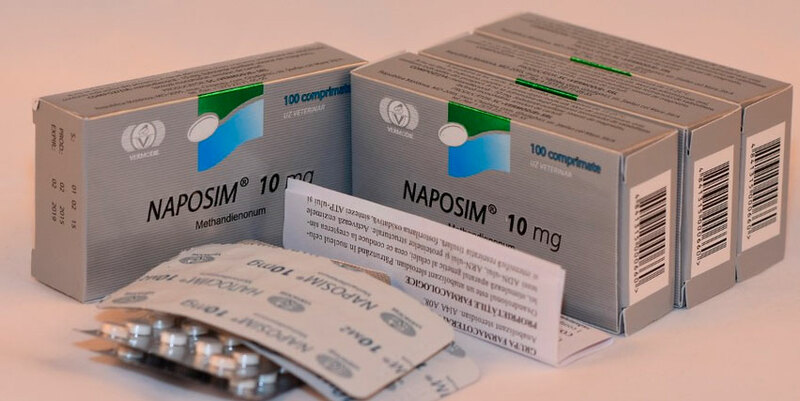 Naposim improves the metabolism of a number of substances (phosphorus, nitrogen, potassium, sodium) in the body and changes in blood composition, due to increased levels of erythropoietin. Most quickly, anabolik is absorbed through the gastrointestinal tract, by binding to the globulin. In the liver, the active substance is not destroyed by interacting with the cell receptors. The drug will be useful for levying muscle mass for both beginners and experienced athletes - a set of raw weight of up to 10 kilograms per cycle of intake is guaranteed. While following certain rules that will help reduce the damage from toxicity and water accumulation in tissues. Adverse effects from admission disappear after stopping the course and recovering the production of natural testosterone. The main thing is to supplement the course with anti-estrogens, so as not to seriously damage your health. To minimize side effects, the key indicator is the correct dosage, intensity of reception and duration of the course. The most frequent side effect of taking Naposim is an acne, high blood pressure and gynecomastia. If the dosage is exceeded, the internal production of natural testosterone, which leads to destruction of the liver, may decrease. For athletes, the dosage is 10-50 milligrams per day, with course duration of 6-8 weeks. The daily dose is divided into 2-3 doses. This approach will ensure maximum effectiveness with minimal side effects. By purchasing anabolik you get at your disposal a powerful steroid that requires a competent and accurate approach to its use. Remember that a violation of dosages, as well as an incorrectly formulated course, can lead to serious side effects up to the destruction of the liver. Observance of precautions, as well as recommendations for admission will help you achieve the best results for the shortest time, avoiding untidy consequences for your body. This drug can be used both individually on the course, and in combination with other steroids to achieve the maximum result.